The average wood deck lasts 10-15 years and has a return on investment of roughly 80% in Severna Park, Maryland, according to Remodeling Magazine’s annual Cost vs. Value report. But, as they say, all good things must come to an end. Eventually you will need to replace or re-deck your once proud wood deck. When this is the case, you have one very important decision to make: wood or composite? When it comes to wood decks, annual maintenance is a must: cleaning, sanding, staining, repeat. Composite decks, like AZEK, meanwhile, are what we call low maintenance. These decks are designed to last without much effort on your part. No sanding. No staining. And just the occasional cleaning to help bring out the deck’s original luster. Composite materials will not weather, warp, or rot, like wood. This is especially nice in Severna Park, where rain (and snow) is almost always in the forecast. Composite materials are also resistant to insects, such as termites. Composite decks will not splinter, meaning no more “ouhies.” Most composite decks are also slip resistant. While composite decks may not have the same return on investment (roughly 62.8%) as wood decks, they will increase your home value by just as much. And for what these decks lack in ROI, they certainly make up for in maintenance costs, or a lack thereof. With 40 years of experience, Freedom Fence and Home has provided the highest quality fence and decking services to its many residential and commercial clients throughout Maryland. Our crews are highly trained and ready to help. 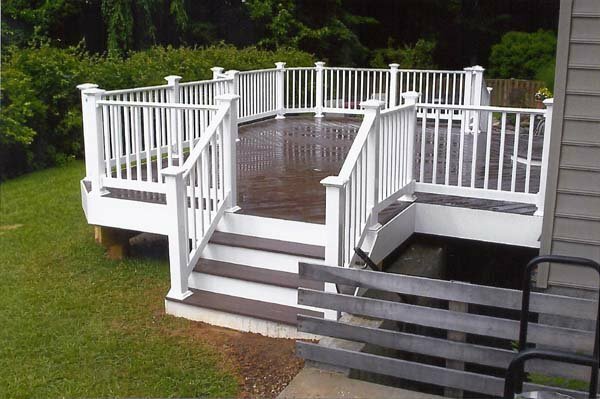 Freedom Fence and home has successfully completed hundreds of re-decking and deck replacements projects throughout Severna Park and the surrounding area. If you have any questions about AZEK Decks, please contact Freedom Fence and Home by calling 443-271-6841 or visit our website. You can also follow us on Facebook and Twitter! This entry was posted on Tuesday, February 10th, 2015	at 7:11 pm	. Both comments and pings are currently closed.